Highland County may have a drug court sooner than expected. Highland County Common Pleas Court Judge Rocky Coss said Friday that while he was attending the National Court Sciences Institute Training on Health Care Outcomes Research Evidence regarding Medically Assisted Treatment for Substance Use Disorders this week, he received the initial certification for the Drug Court Docket from the Specialized Dockets Section of the Ohio Supreme Court. “The approval was obtained much more quickly than originally indicated and should allow us to implement the Drug Court Docket by Aug. 1,” Coss said. Drug courts are specialized dockets that offer defendants charged with drug crimes a chance at cleaning up their record through intensive reporting requirements and treatment. They are growing in popularity around the state due to high success rates and a shift in the understanding of addiction. 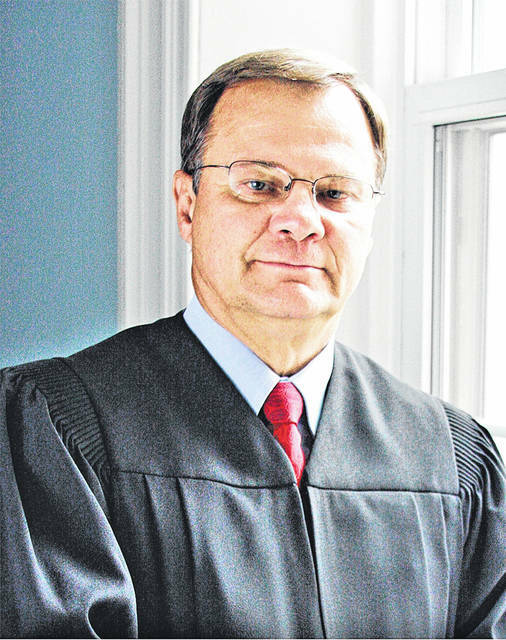 The judge said he knew the Ohio Supreme Court was going to see an influx of drug court applications in March, April and May, so he went to work and submitted an application in early March. “I’m very grateful because I think people are anxious to see it go forward as soon as possible, including me,” Coss said. The next phase of planning, Coss said, will be training of the treatment team members and meetings of an advisory committee over the next two months, which will include visits by team members at treatment meetings and court sessions of drug courts of nearby counties. In a program description he called the “New Way To Recovery Drug Court Docket,” the judge laid out several polices and procedures for the drug court. * To increase successful completion rate of docket participants. If there are 40 participants, 65 percent successfully complete. * To reduce the amount of participant positive urine screens from placement to graduation. To reduce the amount of positive drug tests 50 percent. * To reduce drug-related offenses defined as criminal convictions in which drugs were a contributing factor. To reduce recidivism 25 percent for docket graduates over a one-year period. * To increase the number of docket participants who complete substance abuse treatment within 18 months of program engagement. If there are 40 participants, 65 percent will complete substance abuse treatment within 18 months of program engagement. * To reduce the Ohio Risk Assessment Scores (ORAS) of docket participants. To reduce ORAS scores by 20 percent from program start to finish. “The purpose of the docket is to rehabilitate Highland County and residents of adjoining counties convicted of felonies who have been diagnosed with a substance use disorder that is a contributing or mitigating factor in their law criminal conduct,” the policies and procedures say. “Applicants who are interested in participating must meet legal, clinical, and target criteria before admission. “The judge makes the final decision as to who participates in the docket. Satisfying the legal and clinical and other criteria do not guarantee the right to be admitted into the docket and do not create any right to participation in the drug court docket. * Any drug trafficking offenses. * Any offenses involving the use of a weapon by the offender. * Any offenses involving children who were victims. * Any offenses of violence involving a victim with a serious injury. * Any offense that is a first- or second-degree felony. Persons who do not live in Highland County or in a county adjoining Highland County are not eligible for the Drug Court Docket. The capacity of the program is 40 participants unless expanded by the judge to accommodate unusual circumstances. The mission of the Drug Court Docket is to enhance public safety by preventing recidivism; assisting participants in taking responsibility for their behavioral health issues by turning them from a path of self-destruction to a path of recovery; creating a continuum of approved treatment and rehabilitation services through community programs that meet the needs of participants; and using evidence-based practices in intervention and treatment of substance abuse and other co-occurring mental disorders or medical issues that offenders may have.